This 10mm-high heart is sweet and sophisticated, adding an elegant touch to any outfit, from everyday casual ensembles to more dressy attire. It also adds a pretty picture of your affection. This timeless symbol of love is set with a single, sparkling 0.20 carat round diamond and crafted from gleaming 14K yellow gold. As this petite piece hangs from its coordinating 18-inch box chain, its serves as a versatile reminder of love that's just perfect for any day or night. 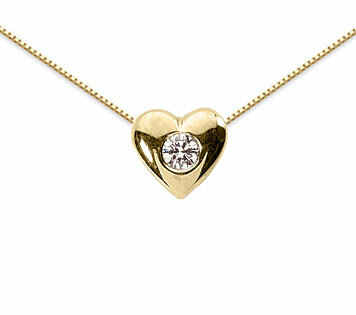 We guarantee our 0.20 Carat Diamond Solitaire Necklace, 14K Yellow Gold to be high quality, authentic jewelry, as described above.